There’s a familiar mugshot in the July/August 2013 issue of Get Out There magazine. 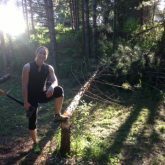 Check out my article on how to train for your first obstacle race and send it to a newbie in YOUR life. I’ve also included tips on what to do in a week before the race. 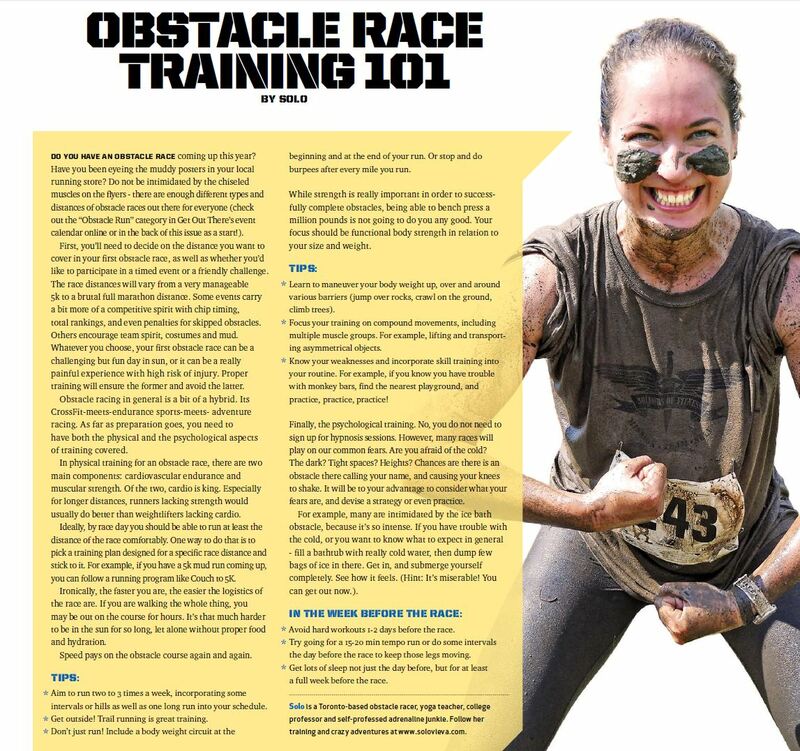 You can also download a pdf – Obstacle Race Training 101. Do you have an obstacle race coming up this year? Have you been eyeing the muddy posters in your local running store? 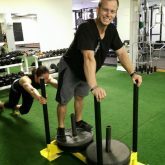 Do not be intimidated by the chiseled muscles on the flyers – there are enough different types and distances of obstacle races out there for everyone. You will have to decide on the distance you want to cover in your first obstacle race, as well as whether you’d like to participate in a timed event or a friendly challenge. The race distances will vary from a very manageable 5k to a brutal full marathon distance. Some events do carry a bit more of a competitive spirit with chipped times, total rankings, and even penalties for skipped obstacles. Others will encourage team spirit, costumes and mud. Whatever you choose, your first obstacle race can be a challenging but fun day in sun, or it can be a really painful experience with high risk of injury. Proper training will ensure the former and avoid the latter. Obstacle racing in general is a bit of a hybrid. It’s CrossFit meets endurance sports meets adventure racing. As far as preparation goes, you need to have both the physical and the psychological aspects of training covered. In physical training for an obstacle race, there are two main components – cardiovascular endurance and muscular strength. Of the two, cardio is king. Especially for longer distances, runners lacking strength would usually do better than weightlifters lacking cardio. Ideally, by race day you should be able to run at least the distance of the race comfortably. One way to do that is to pick a training plan aiming for a specific race distance and stick to it. For example, if you have a 5k mudrun coming up, you can follow a running program like Couch to 5K. Ironically, the faster you are, the easier the logistics of the race are. If you are walking the whole thing, you may be out on the course for hours. It’s that much harder to be in the sun for so long, let alone without proper food and hydration. Speed pays on the obstacle course again and again. – don’t just run! Include a body weight circuit at the beginning and at the end of your run. Or stop and do burpees after every mile you run. While strength is really important in order to successfully complete obstacles, being able to bench press a million pounds is not going to do you any good. 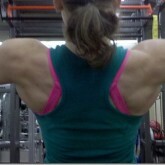 Your focus should be functional body strength in relation to your size and weight. – know your weaknesses and incorporate skill training into your routine – for example, if you know you have trouble with monkey bars, find the nearest playground, and practice, practice, practice! Finally, the psychological training… No, you do not need to sign up for hypnosis sessions. However, many races will play on our common fears. Are you afraid of the cold? The dark? Tight spaces? Heights? Chances are there is an obstacle there calling your name, and causing your knees to shake. It will be to your advantage to consider what your fears are, and devise a strategy or even practice. For example, many are intimidated by the ice bath obstacle, because it’s so intense. If you have trouble with the cold, or you want to know what to expect in general – fill a bathtub with really cold water, then dump few bags of ice in there. Get in, and submerge yourself completely. See how it feels. (Hint: It’s miserable! You can get out now…).